In a small bowl, stir together butter, coconut oil, cilantro, tarragon, chillies, and lime zest; set aside. Using a chef’s knife, split each lobster in half lengthwise through its head and tail. Scoop out the yellow-green lobster coral and fold into the compound butter. Cut off the claws and set aside. Transfer the lobster halves, shell side down, to a baking sheet; crack the lobster claws, remove the meat, and transfer them to the baking sheet. Drizzle lobster halves and claws with extra virgin olive oil and season with salt and pepper with a splash of lemon juice. 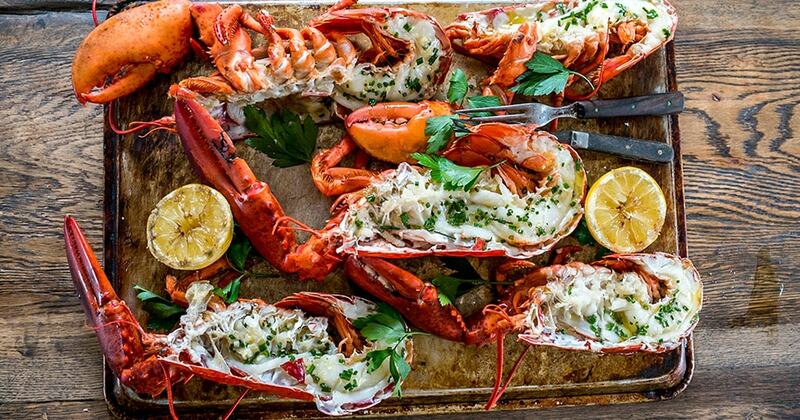 Place lobster halves (flesh side down) and claws on the grill and cook for 5 minutes. Turn over the lobster halves and claws and spread each with some of the coconut compound butter; continue cooking until cooked through, about 3 minutes more. In a small bowl, stir together butter, coconut oil, cilantro, tarragon, chiles, and lime zest; set aside. Using a chef’s knife, split each lobster in half lengthwise through its head and tail. Scoop out the the yellow-green lobster coral and fold into the compound butter. Cut off the claws and set aside. Transfer the lobster halves, shell side down, to a baking sheet; crack the lobster claws, remove the meat, and transfer them to the baking sheet. Drizzle lobster halves and claws with extra virgin olive oil and season with salt and pepper with a splash of lemon juice. Build a medium-hot fire in a charcoal grill or heat a gas grill to medium-high. Place lobster halves (flesh side down) and claws on grill and cook for 5 minutes. Turn over lobster halves and claws and spread each with some of the coconut compound butter; continue cooking until cooked through, about 3 minutes more. Serve with lime wedges.